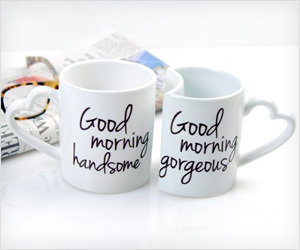 Good Morning Handsome or Good Morning Gorgeous – ain’t that cool one liners for a romantic couple enjoying morning coffee? Checkout these ceramic stoneware cool mugs which are microwave and dishwasher safe. Besides cool looking text print, mugs have lovely heart shaped handles. One mug has curve cut design allowing easy integration of “gorgeous” mug with “handsome” mug – isn’t that how relationships should be like. Good way to start morning with positive fresh feeling of oneness – what say handsome or gorgeous?